Online social media tools like Twitter are often dismissed as time-wasters for the procrastinator in all of us. But they’re also being harnessed for greater causes. You can use Twitter and text messaging to keep members educated and mobilize them for action. Twitter is a “micro-blogging” website that allows you to post frequent, short messages, using your computer or cell phone, to be read by people who’ve signed up to get your entries via their own computer or cell phone. Text messages are nearly the same, but are sent to specific people by cell phone. Here are examples from four campaigns. As the city prepared to close yet more schools last winter, CORE deployed a “Twitter army” to monitor major goings-on in the Chicago education world. At twitter.com/coreteachers, the group began sending live “tweets” from the union’s monthly House of Delegates meetings. The gatherings are sparsely attended by non-delegates, but now everyone can keep tabs on how their dues are spent. The Twitter brigade also descends on monthly Board of Education meetings, which are held during the work day. Shibata says CORE sends “quick bursts of analysis” to teachers, who read up during their lunch breaks. When Secretary of Education Arne Duncan spoke to a pro-privatization group, CORE activists picketed outside and reported via Twitter that they had been threatened with arrest for trying to enter. A flood of teachers responded with solidarity messages, and others asked for directions to the protest. In summer 2008 Teamsters at Sotheby’s, the art auction house in New York, won their best contract in a decade. The campaign was helped along by a text-message phone tree, which members set up to connect the workforce of 50. Rank-and-filer Julian Tysh says the shop’s organizing committee set up the network after discovering that workers young and old were punching out texts on their cell phones. “We started using it for impromptu meetings: hurry up and meet outside, the bargaining committee is going to give you an update. We’d meet on the street in front of the building or on the loading dock.” Seventy to 80 percent showed up. When the campaign began to escalate, says Tysh, designated texters might send messages asking workers to wear a union shirt the next day and gather at the time clock 20 minutes early. Texting brought together far-flung longshore activists in a yearlong contract campaign stretching across dozens of ports from Maine to Texas. The Longshore Workers Coalition, a reform group inside the East Coast Longshoremen’s (ILA) union, used texting to reach hundreds of new recruits, quickly disseminate bargaining updates about concessions union leaders had accepted in secret meetings, and organize a contract rejection that sent the deal back for improvement. Texting is an organizer’s new best friend, says Marsha Niemeijer, LWC staffer. Receiving messages gives a recruit an identification with the organization. From there an organizer can use the connection to have a conversation and build a deeper relationship. 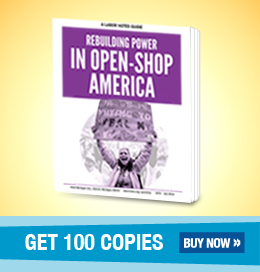 “Besides an information tool, it’s an action tool,” Niemeijer said, noting that she tailored texts to specific ports or groups of activists, inviting members to distribute flyers and join rallies. About 90 percent of the LWC membership is on the text list now, up from 60 percent before the campaign. In Southern California, a digital storytelling and community journalism project built by students and low-wage workers gives recent immigrants without computers a connection to the digital world by using low-cost new media. The project developed software that allows workers to use their phones to capture and publish pictures, videos, and stories about their jobs, families, and activism. The “Mobile Voices” program, or “Vozmob,” exists primarily for day laborers and domestic workers, said Sasha Costanza, a board member. Workers are now editing their own videos and sharing their knowledge at worker-to-worker trainings throughout LA. The software for uploading stories to the web can be downloaded free here, and works on any basic cell phone. Workers send their dispatches by phone to an email address, which directly uploads the messages to Vozmob’s blog. A project of the LA-based Instituto de Educacion Popular del Sur de California, and the University of Southern California, Vozmob has been used by workers to cover a community health conference, job centers and day laborers’ issues, and student organizing against tuition hikes. At the November national Domestic Workers Alliance conference in the Bay Area, a Vozmob member who blogs as “Madelou” trained other domestic workers how to use the technology. Madelou took pictures of the spirited march for domestic workers’ rights and sent updates throughout the conference to the Vozmob blog. Constanza says workers are also using this technology to document their workplace problems on the net with pictures, text, and audio—a great way to catalog evidence for grievances. A version of this article appeared in Labor Notes #370, January 2010. Don't miss an issue, subscribe today.